It started off as a plan to use up some Baby Arugula and White Kidney Beans I had in the fridge. I do so hate to waste food. It eats at me to know something in the fridge may go off. It's a simple dish so to entertain meself, I shall write this post in the voice of one of my favourite old cooking s﻿how from the UK called the Two Fat Ladies. That is not at all a euphamism. It was hosted by two quite posh, older English ladies who were inarguably obese. One was from quite an affluent background, Clarissa, a former barister come etiquette expert and TV chef. She foresook of the drink on the show whist her mate on the show, Jennifer, who also spake with a poshness, rode a motorbike and drank on the show's wind-down showing off her garrishly manicured fingernails. Simply delightful. They cooked some of the most ghastly English fare like a Pork Pie topped with a Pork aspic, Rabbit Tureen, Tomato and Bread Pudding, Whole Flank Steak stuffed into a hollowed Loaf, Chicken Livers wrapped in Bacon.... Lard, Bacon, Offal and Cream to make the French seem as if they are fasting. I loved it, mostly to watch them. Splendid good fun. No fuss about chopping or quantities. This is a frightfully simple dish to have on a warm day. When one can't bear the idea sitting before a large hot dish, salads essential. Admittedly, darlings, you do need to light the stove to cook the Quinoa but thankfully you needn't stand guarding the pot. You place it on the heat and leave it be for 20 minute or until you need it, with the heat off. I used Red Quinoa because I had it to hand it is ravishing in the bowl against the brilliant colours of the other Veg but you could easily substitute regular. 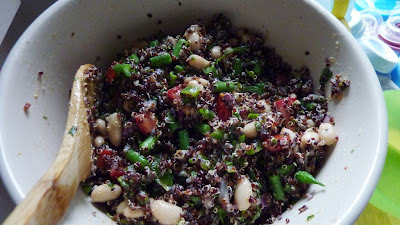 I would normally have used some Garbanzo Beans but I had these dear little White Kidney beans left over so I used them. You can really use whatever favourite Legume you prefer. They add a devine meatiness and creaminess to any salad. Cook the Quinoa as you would. I cook it with double the quantity of Water to Quinoa on High Heat for 15-20 minutes with a pinch of Salt. Set it aside with a cover until cool. Wonderful. When the pot is empty fill and boil with Salted Water. Boil gorgeous French Green Beans aka Haricots Verts Yes, they are different. They're far more slender than the 'regular' as you'd expect. Boil for 2 -3 minutes and drain and rinse with Cold Water and Ice Cubes. Drain thoroughly. You want them cooked but not a murky and mushy Green. You still want a bit of snap. Frightfully summery. Chop. In a large bowl, place the Quinoa. Mix in half a finely chopped Red Onion, Jalapeno Pepper, zest and juice of a Lime. Add a quantity of Fresh Herbs. I harvested some Basil, Chives, Tarragon, Oregano, Mint and Thyme. You can use whichever herbs you have but do use fresh dear. Add a teaspoon of Ground Cumin and Ground Coriander and a measure of Black Pepper. Toss with 2-3 T of Olive Oil and if you have it, add a small measure of White Balsamic. Add the Beans and Haricots and toss gently. You wouldnt want to smash the beans, would you? I decided to add a nice plump Roma Tomato for a bit of natural acidity and balance. I could eat a surfeit of Quinoa. It feels splendidly healthly. Frightlfully so. It's a curious thing to think of a Grain that is considered a Protein. A wonderous thing. Let it stand at room temperature covered for at least half an hour for all the luciousness to meld together. I ate it atop a mound of Arugula and Cooked Shrimp I had in the refridgerator. Toss before eating because I find Arugula a tad too bitter unless dressed. You could equally eat just as it is.